“Trial and error,” “no clear direction,” “no teaching, no nothing”—these are the words that teachers at Kaboson Primary School in Kenya used to describe how they taught the weekly Christian Religious Education class. 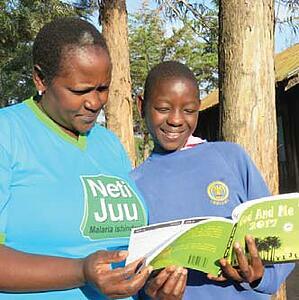 Although the class is required by the Kenyan government, there are no lesson plans provided. Most teachers resorted to simply singing songs, as they didn’t know how to teach Bible stories or use them to explain values by which children should live. Bullying and other examples of poor discipline were frequent in the school, especially between the boys and girls. Mrs. Chororey (pictured above with Abigail), the school’s head teacher, has seen a dramatic difference since the teachers participated in the Kenya Christian Discipleship Project’s training, and received Bibles and teaching materials. Now she says the teachers lead religion classes that are structured, consistent, and interesting, so children learn to live out Christian values. School discipline has improved, and the boys are showing more respect for the girls. In addition to the teachers training, World Vision also trained 40 students as peer educators, which included Abigail (age 14) and Aaron (age 13). Abigail (left) with fellow Bible club leaders. 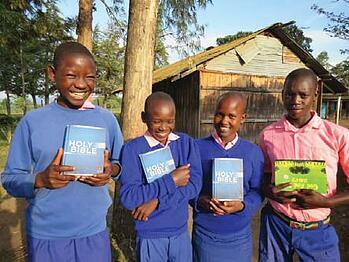 “The Bible club training helped us to know how to lead the clubs when the teachers are not there,” said Abigail. She and Aaron have become strong and confident leaders in the Bible club that meets each Wednesday after school. The Bible club helped children gain confidence in expressing themselves. Abigail shares how children now read and recite memory verses confidently during the daily assembly time—a marked contrast to their previous reluctance to participate. Abigail and Aaron are taking their confidence beyond the school walls. Abigail has befriended an elderly neighbor and convinced her to come to church and stop her illegal sales of alcohol. Aaron is reaching out and praying for an aunt that struggles with alcoholism. "We have learned that God is our helper, protector, and provider,” said Abigail.